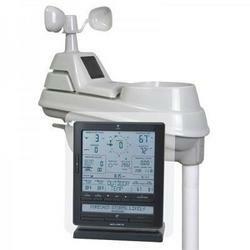 AcuRite Professional Weather Station uses patented Self-Calibrating Technology to provide your personal forecast of 12 to 24 hour weather conditions. Self-Calibrating Forecasting is generated from weather data measured by a sensor in your yard - giving you the most accurate forecast available for your exact location. The bold easy to read LCD screen includes indoor / outdoor temperature and humidity wind speed / direction / chill barometric pressure history moon phase clock calendar and more. Personalize the Weather Ticker to stream the information you want. Custom programmable alarms will alert you when weather conditions change. Display stands upright for tabletop use or is wall-mountable. 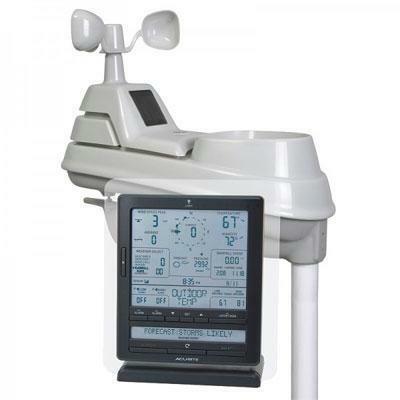 The patent-pending wireless outdoor sensor features 5 different technologies in one easy-to-mount unit: thermometer hygrometer wind speed anemometer wind direction vane and a self-emptying rainfall collector cup. One-year limited warranty.